Sure, like so many of their contemporaries, these progsters are following in the footsteps of Dream Theater, but does this truly do a disservice to their music? In most cases of the dreaded DT-clone, I’m left feeling like great talent is wasted on emulating the work of others who did it better in the first place. Given that an actual member of Dream Theater offers his musical stylings here, it shouldn’t be so much of a surprise that multinational prog metal collective Affector have more than a little in common with the legends. Although we can discount much talk of originality from the start onward, Affector deliver a polished, incredibly performed and tastefully composed hour-plus of traditional progressive metal, and had it not been tarnished by trite lyrical content, I might call it one of my favourite prog metal albums thus far this year. While this may be Affector’s first album, they are by no means newcomers to the prog and metal scene. Here, we have a guitarist from Divinity, drummer from Spock’s Beard frontman Neal Morse’s solo material, bassist from Symphony X, and a singer from Spock’s Beard and Thought Chamber. Make no mistake; each band member has earned a reputation for good reason. If that weren’t enough, “Harmagedon” is rife with guest keyboard solos from some of the most recognizable musicians in prog today- two of Dream Theater’s own keyboardists (Derek Sherinian and Jordan Rudess), Neal Morse and Alex Argento. Throwing in an orchestral introduction, you should be getting the impression by now that Affector have gone all out with this record. The production is professional and slick, and there are more time signature changes than you can share a mellotron at. As for the actual quality of the music, “Harmagedon” starts off in an incredibly impressive fashion, delivering the sort of technical showmanship and complexity we have come to expect from the progressive metal style, paired up with some surprising beauty. Although I’m often wowed by music like this on a cerebral, unfeeling level, Affector manages to make their instrumentation beautiful as well. Daniel Fries’ guitar work is excellent, and while Jordan Rudess’ keyboard solos here may be few and far between, his signature gives an essence of authenticity to the band’s otherwise derivative style. 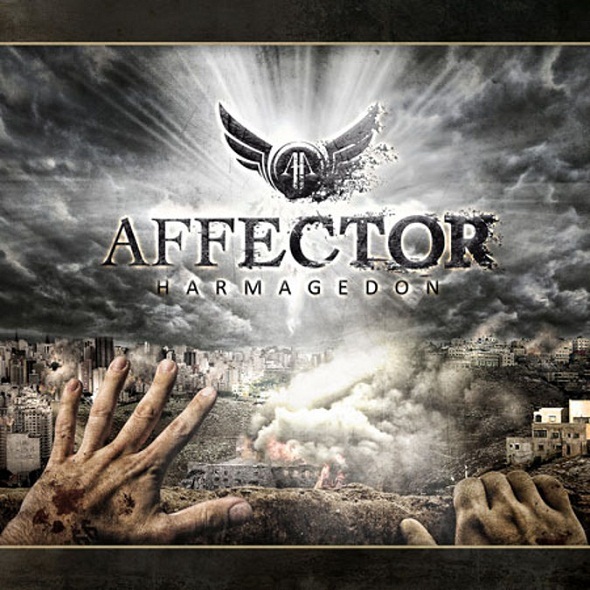 Stylistically, Affector are certainly not busting down any doors and shaking the progressive world, but it’s difficult to speak ill of them as a prog metal act when they do it so damned well. Decidedly less successful than the instrumentation however are the vocals. Although I caught myself thinking throughout the opening instrumental that Affector could have been better with a vocalist, Ted Leonard delivers something of an imbalanced performance on “Harmagedon”. He is certainly a skilled vocalist, but the melodies are something of a hit-or- miss arrangement. The vocal harmonies are lush and powerful, but his voice often sounds a little too weak and vulnerable to pass off some of the more ‘epic’ moments on the album. Perhaps a greater issue at hand however are the lyrics themselves. “Harmagedon” is a concept album dealing with the biblical interpretation of the end of the world- Revelation. While an apocalypse sounds like it could be a very fertile ground for some imaginative lyrics, Affector take it from a purely Christian perspective, and a saccharine one at that. Although I do not personally share or agree with the beliefs of Christianity, I try not to let my religious opinions get in the way. However, it seems the only time Affector stops reminding the listener of its Christian motivations are during the instrumental sections- which, not incoincidentally, happen to be my favourite moments on the album. With lyrics explicitly praising their Lord and denouncing sinners and hedonists, it would be an understatement to say that the message grows tiresome quickly. It’s beautiful to me whenever someone gets inspired or excited enough about something to make art about it, but the lyrics’ utter lack of subtlety or cleverness leave me pretty disappointed. “Harmagedon” at times feels like it is trying a little too hard to be a Christian metal album. The truth is, Affector sound their most inspired and alive when they steer clear of any concept, and simply aim for making the sort of mind-bending progressive metal that has kept proggers on their toes for a good couple of decades. It does not expand much past what Dream Theater have already done, but given this band’s astounding grasp of the style, it doesn’t deter from the excitement of their instrumentation. It’s a very good first step as a new project, and it’s a shame such otherwise minute issues could affect my enjoyment of the album so much.